Beautiful Vintage Geisha Lady Image! This is a Beautiful Vintage Geisha Lady Image! This one comes from a book in my collection, it’s a rare Circa 1907 Pyrography Catalog! The catalog is full of patterns, tools and accessories for the art of Pyrography, which is when you burn a design into wood. This intricate design would have been used for that purpose, and added to boxes or small furniture pieces. Featured above is a lovely young Geisha Lady! 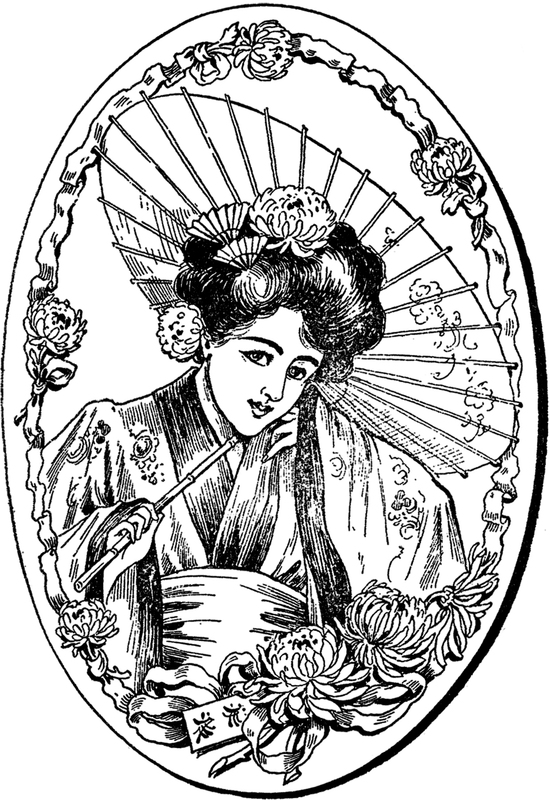 The Lady is wearing a pretty Kimono, and holding a Parasol. She has flowers in her hair, as well as two tiny fans! I love the floral frame on this one too! You might like a similar image from the same book, you can find that one HERE.